Price Range: $.43 - $.95 ea. We've replaced the cardboard backing from a standard note pad with a full-color, personalized magnet! The memo pad AND the magnetic backing is personalized with all your information. 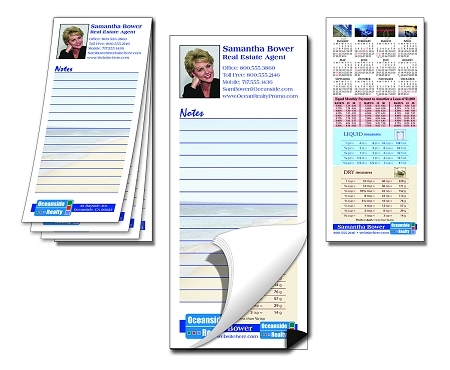 After the sheets run out, your customer is left with a handy reference magnet containing kitchen measurements, full-color calendars, sports schedules, emergency phone numbers, etc. Your name and phone number could be on the side of the fridge for a decade. Now THAT'S return on investment!